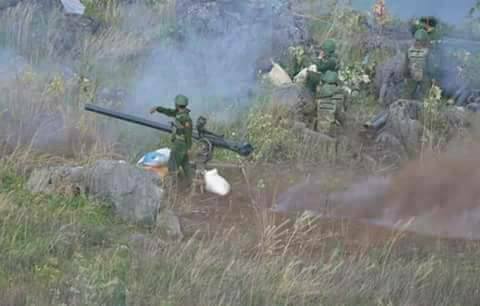 Burma Army (BA) on early Monday morning launched another coordinated artillery shelling on KIA frontline positions. BA troops currently based at based at Dum Bau Bum fired two 81mm mortar rounds on KIA 15th battalion’s positions at Chyahkrai and Mung Hka Pa in Shwegu township on April 30 at 3 am, and four 81mm mortar rounds on April 29 at 3:30 pm. BA troops based at Walai Hpum Yang fired eight 81mm mortar rounds on KIA 21st battalion’s positions at Lagat Bum in Shwegu township on April 30 at 3 am, Hpundu Kawng-based BA troops fired five 60mm mortar rounds towards Maga Hkyet around the same time. BA troops based at Hkang Kai Bum and Hpun Pyen Bum fired 13 artillery rounds on KIA 19th battalion’s positions and Wa Ra Bum in Laiza area on April 30 between 3 am – 3:20 am, and Alaw Bum-based BA troops fired four 60mm mortar rounds on KIA 30th battalion’s positions at the same time. BA troops based at Chyauk Pya fired two 81mm mortar rounds and two 60mm mortar rounds on KIA 27th battalion’s positions at Bau Noi in Mansi township on April 30 between 3 am – 3:40 am, Kai Htik-based BA troops fired seven 81mm mortar rounds at Pali Bum, Maji Gung Kaba-based BA troops fired five 81mm mortar rounds at Hpara, and Mahtek-based BA troops fired two 81mm mortar rounds at Hpara and U Ra Bum around the same time. BA troops based at Sama fired 3 artillery rounds on KIA 233rd mobile battalion’ positions around Laiza area on April 30 between 3 am – 3:05 am, and Gang Dau Yang-based BA troops fired three 81mm mortar rounds on KIA 256th mobile battalion’s positions at Ja Hta around the same time. Meanwhile, ground battles continue to rage between KIA and BA in Danai, Myitkyina and Kutkai townships. KIA troops under it 2nd brigade and BA troops fought at Shabak farm in Danai township on April 30 between 11:30 am – 11:45 am. In Myitkyina township, KIA’s 11th battalion troops and BA troops engaged in a series of battles at Kawa Hka on April 29-30. In Kutkai township in northern Shan state, KIA’s 36th battalion troops and BA troops under 55th Light Infantry Division battled at the confluence of Nam Mwi stream and Nam Hkawng stream near Mung Ya village on April 30 at around 9 am.